Interleukin-33 (IL-33) is a nuclear cytokine from the IL-1 family with critical roles in tissue homeostasis and repair, type 2 immunity, viral infection, inflammation and allergy. It binds to the ST2 receptor expressed on cells of the innate and adaptive immune system. 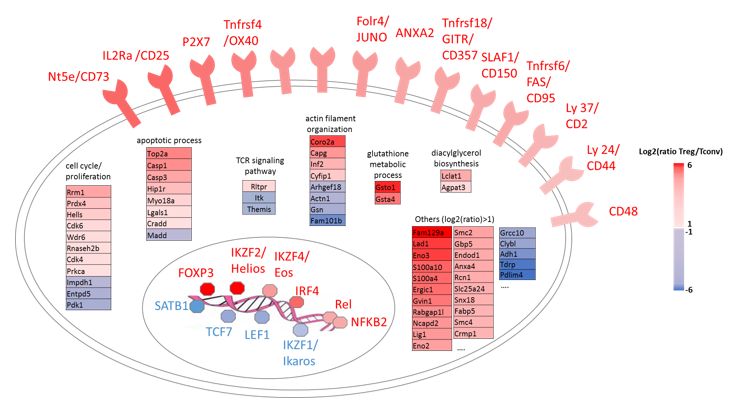 Major target cells of IL-33 include group 2 innate lymphoid cells (ILC2s), mast cells, and certain subsets of regulatory T cells. IL-33 plays a role in many important diseases. 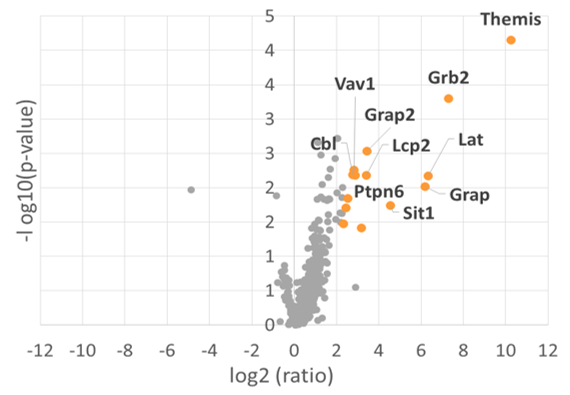 Particularly, several genome-wide association identified the genes of IL-33 and ST2 as major susceptibility loci for human asthma. In collaboration with the team of J-P Girard at IPBS, we use mass spectrometry techniques to better characterize the mechanisms of IL-33 action. IL-33 contains a N-terminal chromatin-binding domain: it is mainly sequestered in the nucleus of epithelial end endothelial cells from barrier tissues, and is released upon cellular damage or necrose. On the other hand, its C-terminal part is composed of a bioactive IL1-like cytokine domain. The group of J-P Girard demonstrated that IL-33 is not regulated as IL-1b through maturation by caspase-1 (which rather inactivates IL-33 by cleaving inside the IL1-like domain), but through proteolytic maturation by inflammatory proteases. We use mass spectrometry analysis to identify highly active mature forms of the protein resulting from processing by activator proteases, and map the cleavage sites in the central domain of IL-33. Extracellular IL-33 is known to activate a growing number of target cells (including group 2 innate lymphoid cells, mast cells, regulatory T cells, and endothelial cells). 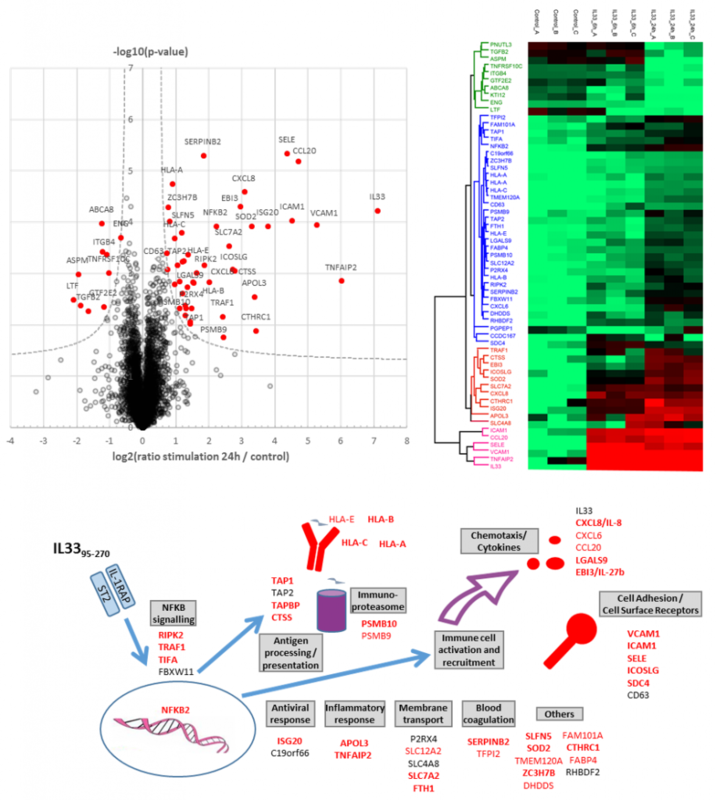 We use large-scale proteomics to characterize the extracellular and intracellular role of IL-33 on these cells. Lefrancais, E., Roga, S., Gautier, V., Gonzalez-de-Peredo, A., Monsarrat, B., Girard, J. P., and Cayrol, C. (2012) IL-33 is processed into mature bioactive forms by neutrophil elastase and cathepsin G. PNAS 109, 1673-1678. One of our research areas is to decipher, at the cellular and molecular levels, the functional mechanisms of T lymphocytes using proteomic approaches. 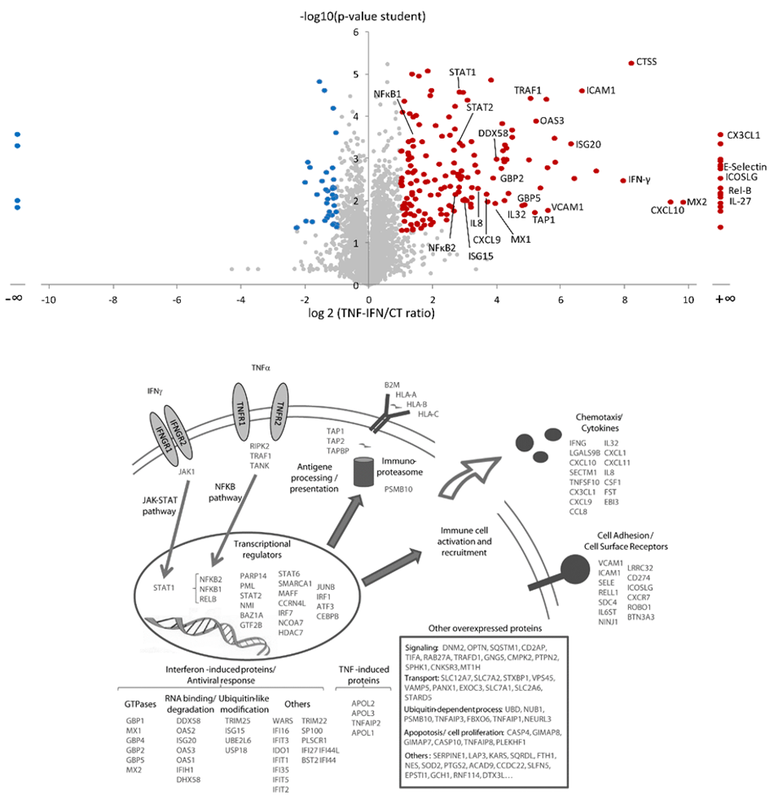 In collaboration with teams bringing complementary expertise in immunopathology and T cell signaling (B. Malissen, CIML, Marseille; R. Lesourne, CPTP, Toulouse), we are involved in the detailed characterization of the T Cell Receptor (TCR) pathway, by analyzing the signalosome of several key components of this complex system using AP-MS strategies. 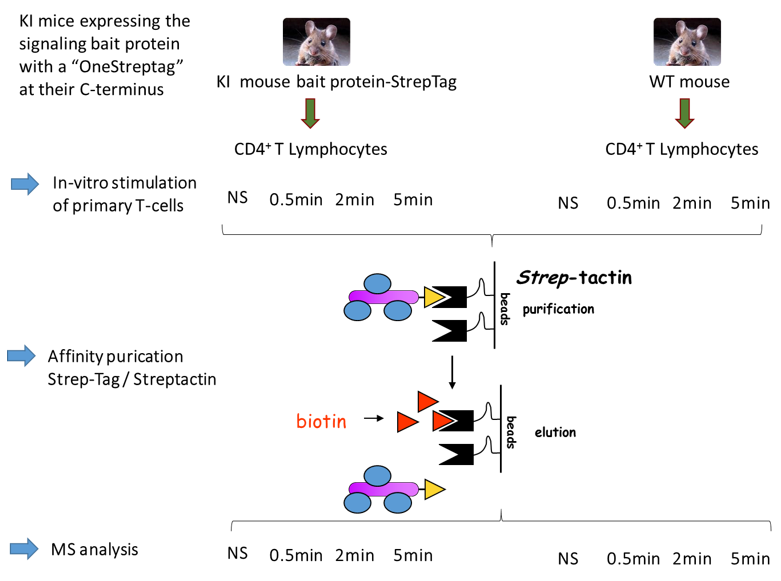 In collaboration with R. Roncagalli and B. Malissen (CIML, Marseille), we use KI mouse model expressing different bait proteins of the TCR pathway with a C-terminal One-Strep-tag to enrich endogenous signaling complexes at different time points following TCR activation. 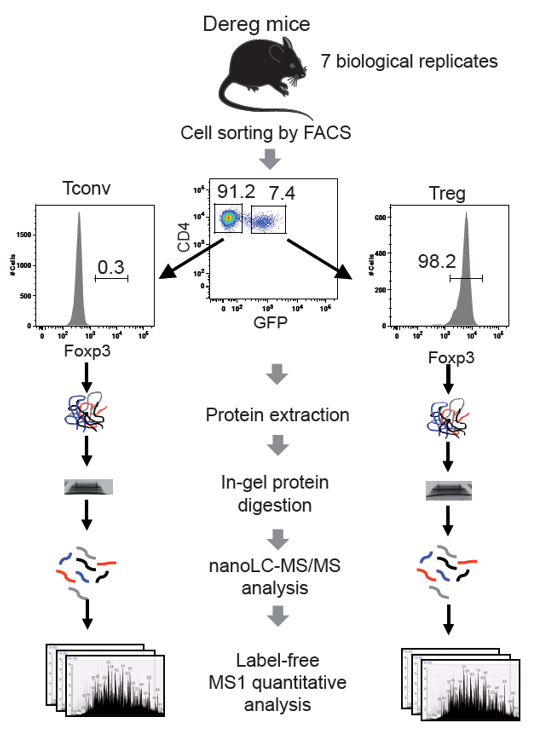 Time resolved proteomics allows to obtain dynamics information and to gain insight into the mechanisms of action of several proteins and the internal organization of the interactomes. 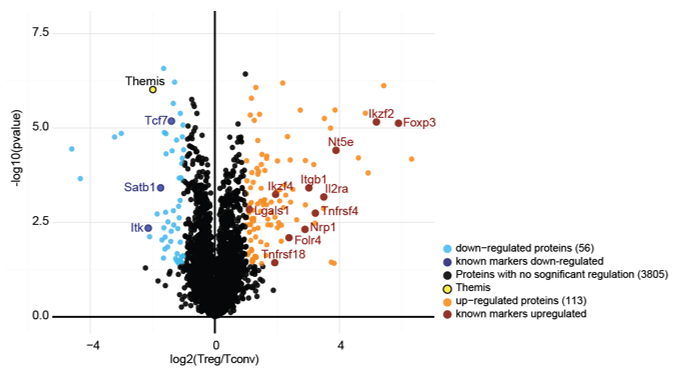 Using this methodology, we characterized the interactome of PAG (Phosphoprotein associated with glycosphingolipid-enriched microdomains), a ubiquitously expressed transmembrane adaptor protein present in lipid rafts and involved in the regulation of TCR signaling. 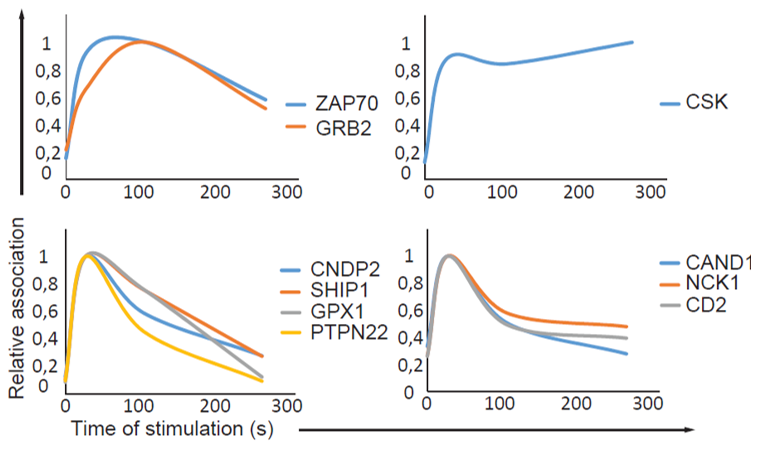 Conversely to the previously proposed model, we showed that PAG is quickly phosphorylated and binds CSK and other inhibitory molecules upon T cell activation. 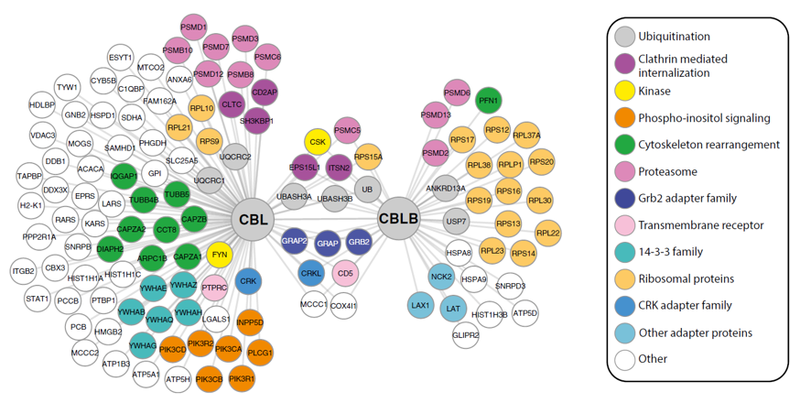 We also applied a similar approach to analyze the differences between the molecular networks formed around the E3 ubiquitin–protein ligases CBL and CBLB, two negative regulators of the TCR. 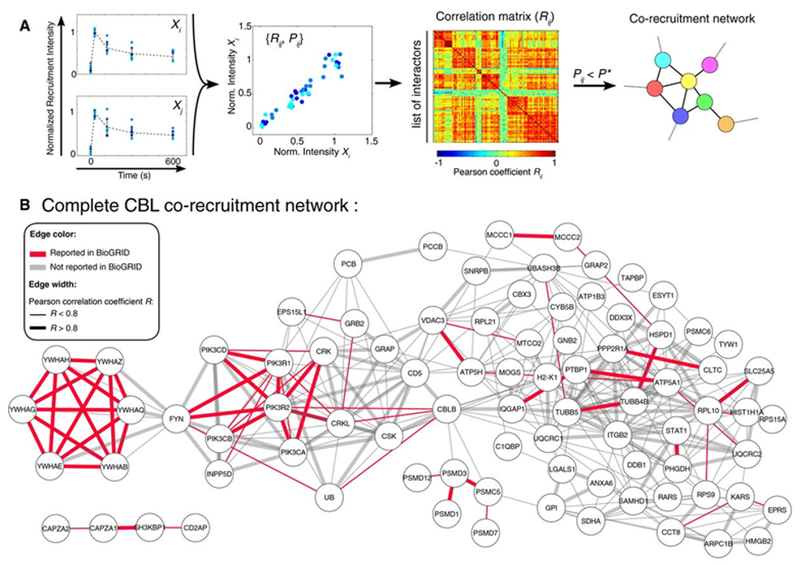 We monitored the dynamics of the CBL and CBLB signaling complexes that assemble in T cells following TCR stimulation, and exploit correlations in protein association with CBL and CBLB as a function of time for predicting the occurrence of direct physical association between them. 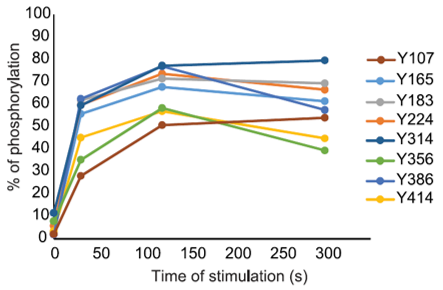 By combining co-recruitment analysis with biochemical analysis, we demonstrated that the CD5 transmembrane receptor constitutes a key scaffold for CBL- and CBLBmediated ubiquitylation following TCR engagement. 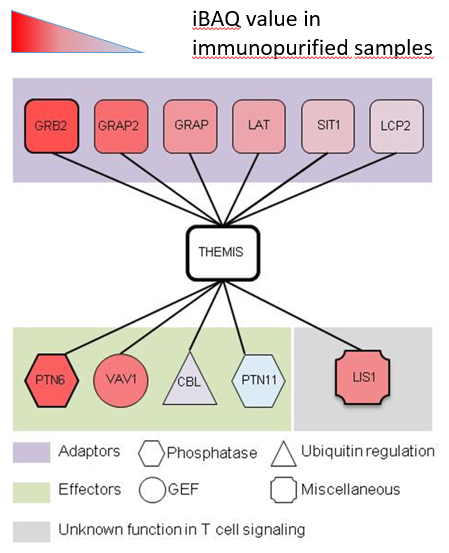 In collaboration with R. Lesourne (CPTP, Toulouse), we characterized the interactome of Themis1 in primary mouse thymocytes, through immunopurification of endogenous Themis1. 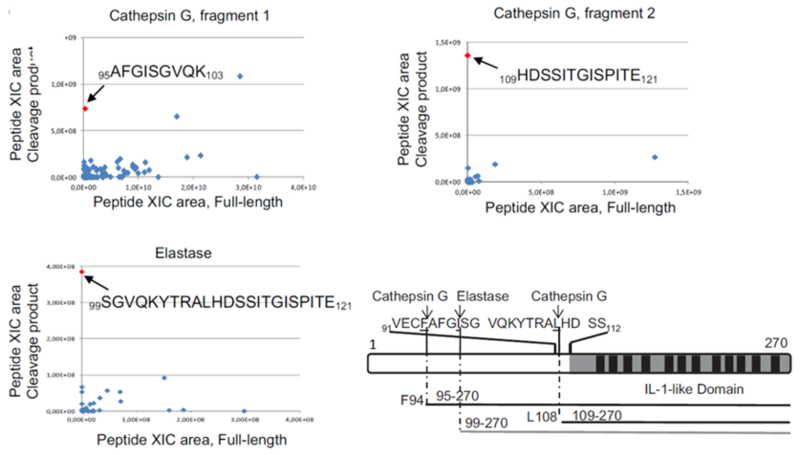 Quantitative proteomics identified SHP-1/PTN6 and Vav1 as predominant interacting partners of Themis1. Further biological studies identified a primary role for Themis1 in regulating Grb2 stability and Vav1 effector function. Conversely to the previously proposed model of Themis1 acting as an attenuator of TCR signaling, these studies suggested that Themis1 might rather activate TCR signaling. 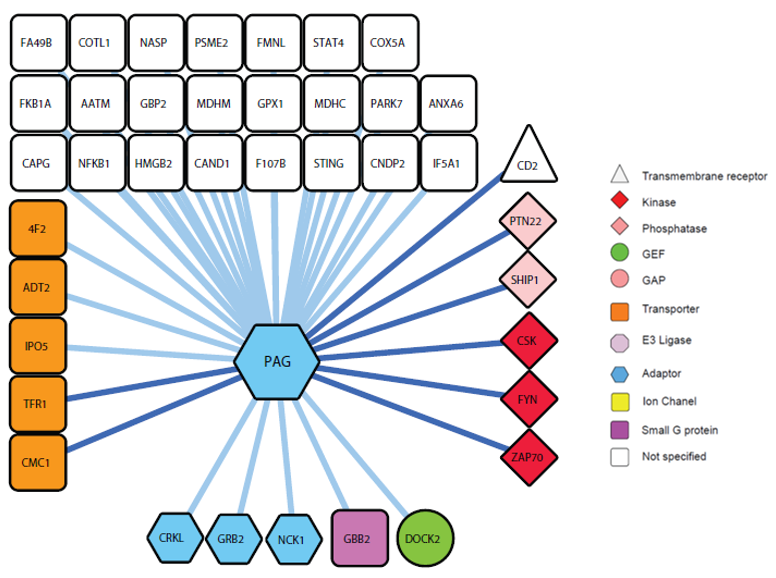 Reginald et al (2015) Revisiting the Timing of Action of the PAG Adaptor Using Quantitative Proteomics Analysis of Primary T Cells. Journal of immunology 195, 5472-5481. Voisinne et al (2016) Co-recruitment analysis of the CBL and CBLB signalosomes in primary T cells identifies CD5 as a key regulator of TCR-induced ubiquitylation. Mol Syst Biol 12, 876. Zvezdova et al (2016) Themis1 enhances T cell receptor signaling during thymocyte development by promoting Vav1 activity and Grb2 stability. Sci Signal 9, ra51.